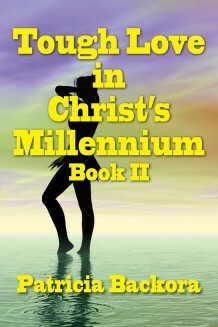 Tough Love in Christ’s Millennium: Book Two: A Panorama of Judgment continues to show how life may be in Christ’s 1000-year reign. Through the character of Saul Savage we see one man’s redemption from disobedience to God’s representatives (Lord Stephen, Prince Daniel, and Governor Lucas). In the Data Room with its Nerve-plex and Data Cams, Saul works on his designs for virtual games (like “Quasar Quest” and “Comet Collision”) while Nabal, his son, and Ramera, his daughter, continue their mischief. And Saul suffers for his sins his wife Lydia lies in another man’s bed. In the end Prince Daniel reveals to Saul the heartbreaking truth about Lydia while Susanna makes one last-ditch attempt to save her from herself. The finale sees Christ, the Great Physician, heal the bodies and souls of repentant family members while Lydia meets her day of judgment.